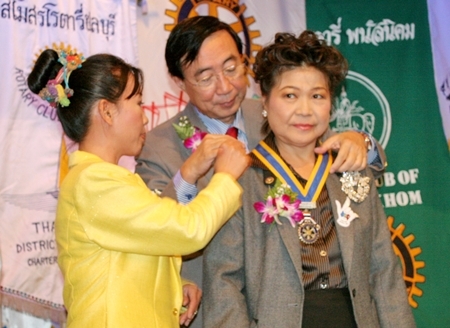 Rotary International’s summer tradition of bidding adieu to outgoing officers and welcoming new leaders for the next year played out across the Eastern Seaboard in June as clubs serving all nationalities and languages held installation ceremonies in Pattaya. As the Rotary year approached its annual June 30 end, nine District 3340 clubs hosted their always-festive and much-anticipated installation banquets. 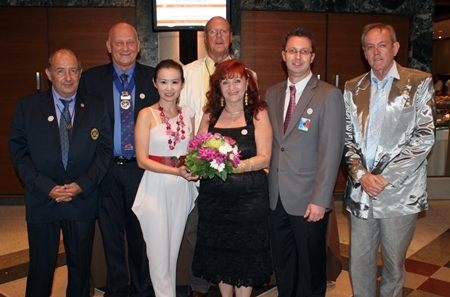 Two clubs – the Rotary Club of the Eastern Seaboard and German-language Rotary Club of Phoenix Pattaya kicked off the season June 1 with a joint ceremony at the Holiday Inn Pattaya. DG Thatree Leetheeraprasert congratulates outgoing president Carl Dyson as DG Suwan Sanpaporn installs Nigel Quennel as the new president of the Rotary Club Eastern Seaboard. 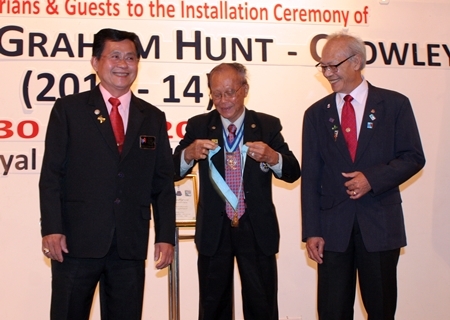 Five past and present District 3340 governors attended the gala, led by newly installed District Governor Suwan Sanpaporn and outgoing District Governor Thatree Leetheeraprasert. Also attending were past governors Premprecha Dibbayawan, Seri Eiamchamroonlarp and Pratheep Malhotra, who offered the toast and a short speech. 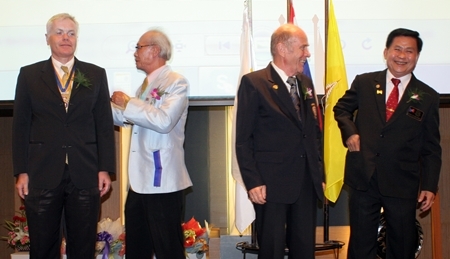 Outgoing president Heiner Moessing and incoming president Dr Otmar Deter of the Rotary Club Phoenix Pattaya participate in the installation rituals. 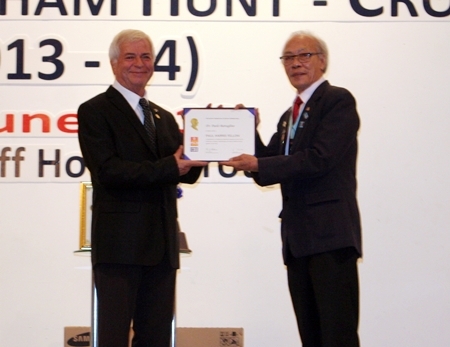 Outgoing Eastern Seaboard President Carl R. Dyson passed the reigns he held for two years over to Nigel Quennell. 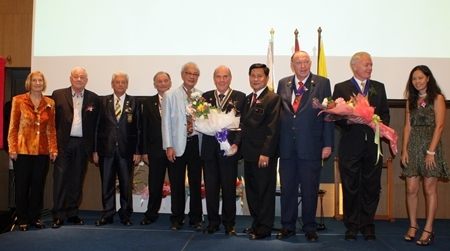 Otmar Deter of the Phoenix-Pattaya chapter took over from President Heiner Moessing. Over a sumptuous buffet, Rotarians enjoyed a funky stage show from the children of the Child Protection & Development Center, a tango performance from the Rosinka Ballet School, and a couple from Steps & Rhythm Dance Academy showed off their salsa moves. 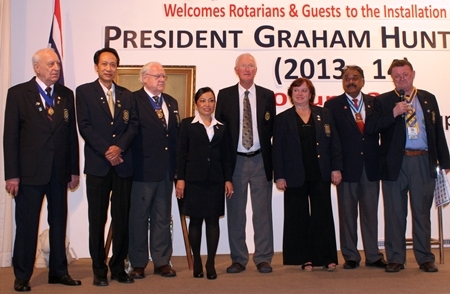 After the new presidents received their chains from DGE Suwan, Quennell said he planned to focus on recruiting a new generation of Rotarians and reviewed ongoing and future projects planned by the Eastern Seaboard club. Among them are a “Green Pattaya” environmental initiative, a water-filter project spearheaded by a Bangkok model, and a welfare trip to Phangnga. 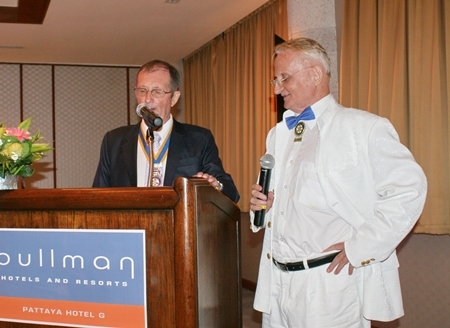 In his installation speech, Deter noted that Rotarians don’t do what they do for recognition, but simply to help others. 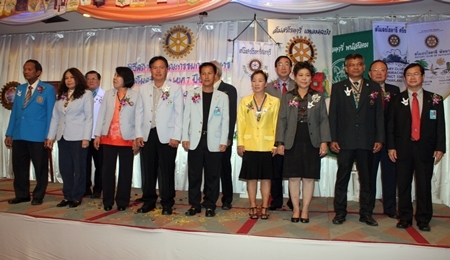 The line-up of the new board of directors of the Rotary Club Eastern Seaboard (above) and the Rotary Club Phoenix Pattaya (below). 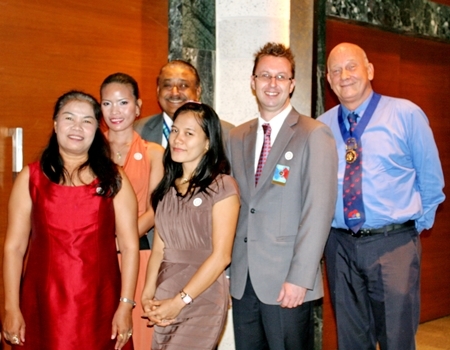 The French-speaking Rotary Club Pattaya Marina was next up June 8, with its grand installation dinner at Pullman Hotel G.
Members from many area Rotary and charity clubs attended to see Gerard Porcorn installed as new president for the 2013-14 term. The event was presided over by Past District Governor Peter Malhotra, who again put his thought provoking spin on Rotary’s work and mission. 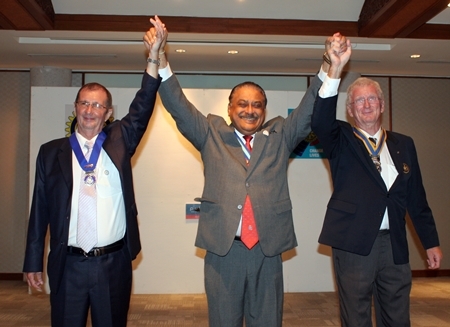 PDG Peter Malhotra proclaims Gerard Porcon (right) as the new president of the Rotary Club Pattaya Marina as Joseph Roy (left) successfully completes his term of office. 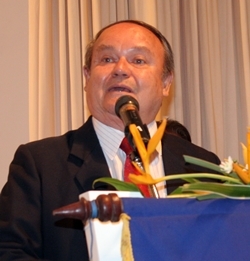 Outgoing President Joseph Roy thanked club members for their support of various projects, including bringing electricity to a rural village in northern Thailand. 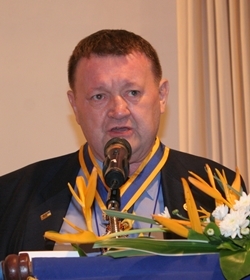 In his first speech, Porcorn noted he has twice served as a Rotary Club president, in France and here at the Rotary Club of Pattaya. He said he believes that with his experience he will guide and lead steer the Pattaya Marina chapter to achieve its goals. Line-up of the 2013-14 Board of Directors. 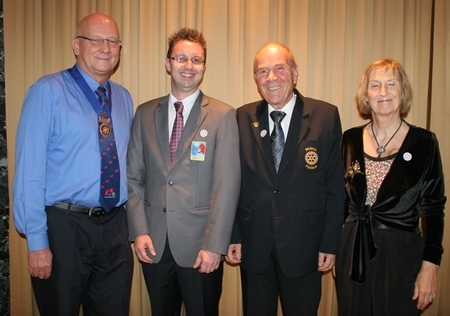 The area’s largest clubs also waited until nearly the July 1 start of the new term to install their officers. The Rotary clubs of Pattaya, Chonburi, Sriracha, Laem Chabang, and Phanasnikom held their joint ceremony June 28 at Pattaya’s Town in Town Hotel. A large contingent of District Governors past, present and future attended the ceremony. Outgoing and incoming presidents lineup for the changing of the guard. Outgoing Pattaya club President Jamlong Phassara led the large crowd in singing of the national anthem, followed by a welcome from Pattaya city spokeswoman Yuwathida Jeerapat. 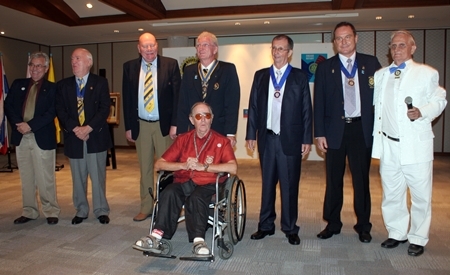 All the past and current governors joined in to install the new presidents and board members from the five clubs. Rev. 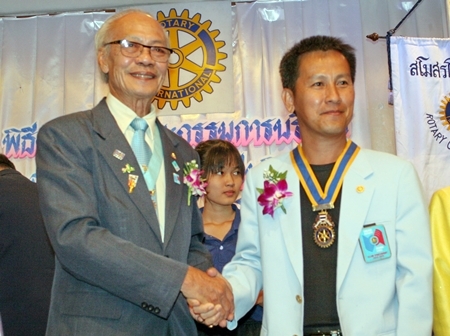 Michael Picharn Jaiseri, president of the Father Ray Foundation, took over the Pattaya club presidency from Jamlong Passra. Urairak Kraisuwansarn was chosen to lead the Sriracha club, taking over from Kancha Sphrangphon. 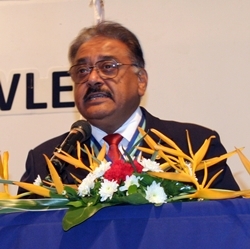 Sumet Makkrakkul will serve as the next president at the Laem Chabang chapter, succeeding Patcharee Ruenjit. 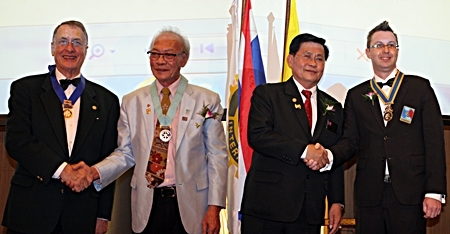 Jaroon Khumpunya took the mantle from Rossakhun Tantiwuth at the Laem Chabang club and Kamthorn Pongsutthiyakorn was installed as president in Phanasnikom. 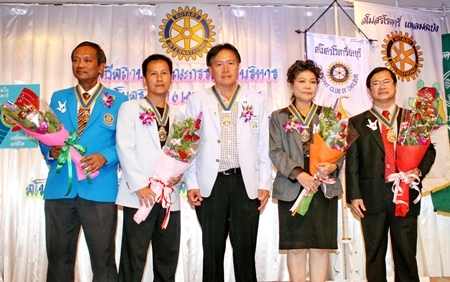 The new presidents, Kamthorn Pongsutiyakorn (RC Panas Nikom), Sumet Makkrakul (RC Laem Chabang), Urairak Kraisuwanasarn (RC Sriracha), Jaroonrit Kampanya (RC Chonburi) and Dr Fr Pichan Jaiseri (RC Pattaya). 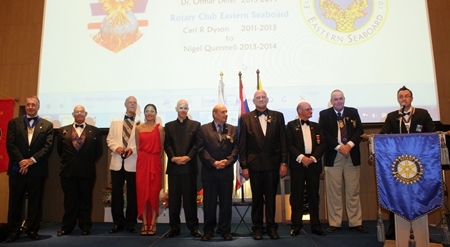 The oldest English-speaking Rotary Club in the area, Jomtien-Pattaya, waited until the organization’s equivalent of “new year’s eve” to install its new officers June 30 at the Royal Cliff Beach Resort. 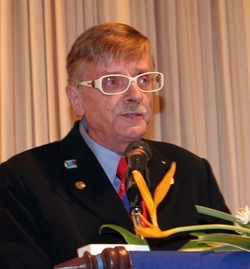 Graham Hunt-Crowley took over as president from Dieter Reigber, who couldn’t attend the party due to health reasons. Another full slate of district governors did attend, however, including Suwan, Thatree, Malhotra, Premprecha, Siri and Wiwat Pipatchaiyasiri, Jin Srikasikorn, and Thirayuth Wattanathirawoot. Also present was district secretary Jedsada Buntoonrungsi. 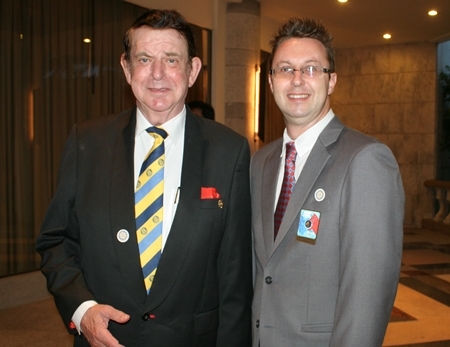 Rotarians from near and far joined in for the evening, including a visitor from the Rotary Club of Knutsford in England. He received a bottle of whiskey as a prize for travelling the longest distance, but charitably auctioned it off immediately for 1,500 baht. PDG Peter Malhotra was at his best on stage as MC, electrifying the crowd with his remarks prodding the program on at a steady pace. PDG Premprecha Dibbayawan performed the toast and Nayana Stark and Dzenana Popin carried the Thai and Rotary flags respectively, while CP Martin Brands delivered the valediction for Dieter Reigber. Italian Consul Dr Paolo Battaglino was honored as well, receiving the prestigious Rotary Paul Harris Fellow Award and honorary club membership. The night also marked the official passing of the governor’s chain of office from DG Thatree to Governor Suwan. 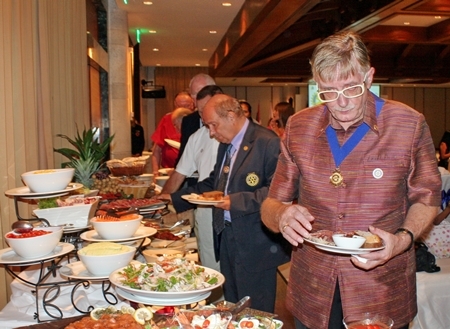 Formalities aside, guests enjoyed a large buffet, wine and German beer sponsored by Paulaner. Raffle prizes included flat-screen televisions, airline tickets and a 15,000 baht voucher from Dr. William van Ewijk. The International Dance School provided the entertainment with exquisite dancers showing off classic belly dancing and modern dance numbers. Closing the evening, new president Hunt-Crowley told the Rotarians he, too, wanted to recruit new, young members. President Graham hunt-Crowley delivers his address. 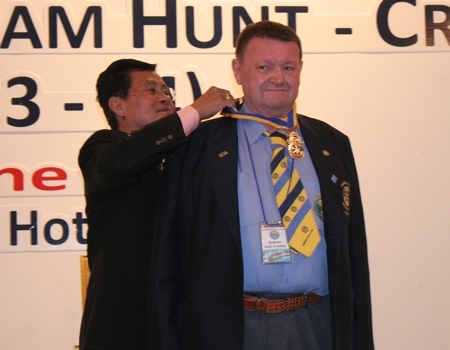 DGE Suwan Sanpaporn installs Graham Hunt-Crowley as president of the Rotary Club of Jomtien-Pattaya. The new board of directors for 2013-14. Senior PDG Jin Srikasikorn performs the somber ceremony of transferring the governor’s chain of office from Thatree Leetheeraprasert (right) to Suwan Sanpaporn (left). Dr Paolo Battaglino (left) is the proud recipient of the Paul Harris Fellow award.